Sunday’s ad is for Pabst Blue Ribbon, from 1951. 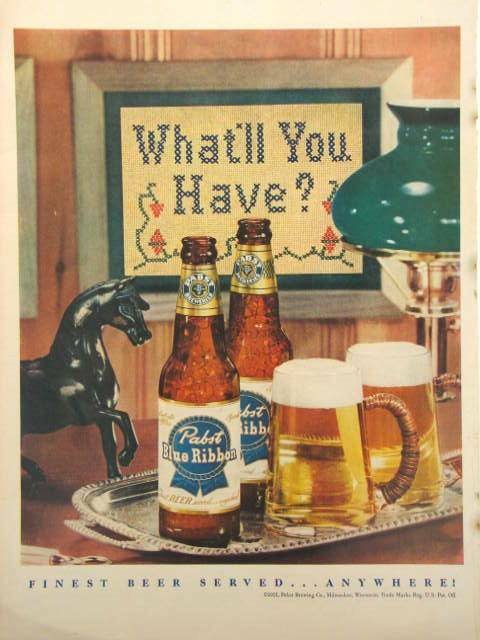 Starting in the early 1950s, Pabst started a new ad campaign with the tagline “What’ll You Have” which lasted for a few years. They were colorful ads, and often had the tagline spelled out in creative ways. In this ad, “What’ll You Have” is written in cross-stitch hanging on the wall. And naturally, there are two bottles and glasses of Pabst on a silver tray below the framed needlework.